Charlton Young, whose coaching knowledge and incredible ability to teach the game of basketball has helped transform the Seminoles into one of the most dynamic teams in all of college basketball, is in his sixth season as an assistant coach at Florida State. During his first five seasons in Tallahassee, the Seminoles are one of the nation’s top offensive units and one of the toughest defensive teams in all of college basketball. Young is in his 23rd season as a coach at the collegiate level during the 2018-19 season. He was a successful head coach at Georgia Southern (2010-13) where he helped the Eagles become one of the top teams in the Southern Conference. Young has been an assistant coach in seven different conferences including the ACC and the SEC. In his first five seasons at Florida State, Young has played a major role in helping the Seminoles win 110 games (an average of 22.0 games a season), 46 ACC games (an average of 9.2 conference wins per season) and play in four postseason tournaments including the 2017 and 2018 NCAA Tournaments. In 2016-17, the Seminoles came within one win of the school record for wins in a season, tied the school record for ACC wins in a season, finished in a school record-tying second place in the ACC standings, advanced to the semifinals of the ACC Tournament for only the fourth time in school history and earned a school record-tying No. 3 seed in the NCAA Tournament. Young’s coaching talents were on display during the 2017-18 season as Florida State advanced to the Elite Eight of the NCAA Tournament for the first time since 1993 and for only the third time in school history. The Seminoles finished with a 23-12 record, a 9-9 mark in ACC play, won the Jamaica Classic and played in the NCAA Tournament for the second consecutive season and for the sixth time in the last 10 years. Florida State was one of two ACC teams which advanced to the Elite Eight of the NCAA Tournament, defeated a near school-record six nationally ranked teams and three teams seeded higher than them in the NCAA Tournament for the first time in school history. Young’s work as a player development coach helped Florida State to a 26-9 overall record and a 12-6 record in the ACC in 2016-17. The Seminoles played in the NCAA Tournament, defeated a school record-tying seven ranked teams and were ranked as high as No. 6 nationally. The Seminoles set the school record with 24 regular season wins and won 12 conference games for just the second time in school history. In the last two seasons, Florida State’s offensive numbers have been among the best in the history of the program. The Seminoles averaged 81.0 points scored per game in the last two seasons and are one of only two teams in the ACC to rank in the top three in scoring offense in the last two seasons. Defensively, the Seminoles averaged 7.1 steals per game (second in the ACC), 5.2 blocked shots (third in the ACC) and allowed only 72.4 points scored per game during the 2017 and 2018 seasons. Florida State averaged 80 or more points scored in the last two seasons for the first time since the 1988 and 1989 seasons. During the 2017 season, Young coached Florida State during its incredible early ACC season run that saw the Seminoles win five of six consecutive games against nationally ranked teams. The Seminoles played and defeated No. 11 Virginia (60-58, Dec. 31), No. 21 Virginia Tech (93-78, Jan, 7), No. 7 Duke (88-72, Jan, 10), No. 15 Notre Dame (83-80, Jan. 15) and No. 12 Louisville (73-68, Jan. 21) in one of the greatest six-game spans in school and ACC history. Florida State’s 5-1 record in the six-game stretch is the best by an ACC team in league history against six consecutive nationally ranked teams. Young specifically worked with Seminole point guard Xavier Rathan-Mayes, who finished third in the ACC in assist:turnover ratio (2.6:1) and was named to the All-ACC Defensive Team in 2017. Rathan-Mayes was signed as a free agent by the New York Knicks following the 2016-17 season and made his NBA debut with the Memphis Grizzlies on March 5, 2018. Young’s ability to identify and successfully recruit the nation’s top talent to Florida State is another of the big reasons why the Seminoles are in the national picture and contenders for the ACC Championship every year. He is a top-notch recruiter, as well as a coach, who can teach and coach the game as it is played by today’s superstar athletes. Young annually makes Florida State a big player for the most important recruits and his closing ability has helped the Seminoles land top-10 recruiting classes in each of his first four seasons in Tallahassee. Young has helped recruit three of the top classes in school history including the Seminoles’ 2015 class which was ranked as the third best class in the nation. Young’s recruiting successes in the last four seasons have enabled the Seminoles to chart a course for long-term winning in Tallahassee. The caliber of each player currently on Florida State’s roster, and those who have pledged to become Seminoles, will continue to help the program flourish now and into the future as it becomes one of the top programs in college basketball. During his first five seasons at Florida State, he helped coach the Seminoles to the Elite Eight of the NCAA Tournament (2018), has coached two NBA first round Draft selections (Malik Beasley in 2016 and Jonathan Isaac in 2017), six All-ACC selections, three All-ACC Freshman team selections and helped Florida State cement itself as the third winningest program in the ACC in the last 13 seasons. Young was instrumental in the recruitment and development of talented forward Dwayne Bacon. Bacon emerged as one of the top players in all of college basketball during his two-year career at Florida State as he led the Seminoles in scoring in both of his two seasons in Tallahassee, earned Freshman All-American and All-ACC Second Team honors and led the Seminoles to the 2017 NCAA Tournament. Bacon was part of the season-long rotation for the Charlotte Hornets during his first season in the NBA. As a coach and a player at the highest levels of college basketball during his career, Young has developed a shining reputation as one of the standout people in the coaching profession. He has crafted his reputation through hard work, a stellar eye for talent and the incredible ability to help each player he coaches become the best they can be at everything they want to accomplish – both on and off of the basketball court. As a player, he was an all-conference performer who played professionally. As a coach, he has made it his mission to help the players he coaches achieve the same lofty goals. Prior to his arrival in Tallahassee, Young spent four seasons as the head coach at his alma mater, Georgia Southern. Georgia Southern won 15 games during the 2012 season – more wins than it had earned in any of the five previous seasons and won 29 games in his final two seasons. He led the Eagles to success in the Southern Conference as they won 12 conference games during the 2011-12 season to tie the school record for Southern Conference wins in a single season. Young coached five players who earned All-Southern Conference honors including two (Willie Powers in 2010 and Eric Ferguson in 2012) who earned all-conference first team honors. A 1994 graduate of Georgia Southern, Young led the Eagles to the 1992 Trans America Athletic Conference Championship – only the third conference championship in school history. The Eagles made the third NCAA Tournament appearance in school history in 1992 playing Oklahoma State at the Omni in Atlanta, Ga.
Young was the head coach at his alma mater, Georgia Southern, from 2010-13 where he led the Eagles to the same success as their head coach as he did as a star player at the school from 1990-93. The Eagles were collectively and individually successful during his four seasons as the head coach at the Statesboro, Ga., school. He led the Eagles to a second place finish in the Southern Conference standings in 2012 as the team earned the second-best turnaround in league history. For his efforts, he was honored as the Southern Conference Coach of the Year by multiple publications (including rushthecourt.net) and was a finalist for the Ben Jobe Award which is presented annually to the top Division I minority head coach. Young coached five All-Southern Conference selections including Willie Powers (all-conference third team in 2010) and Eric Ferguson (all-conference first team in 2013, all-conference first-team and All-Southern Conference Tournament team in 2012 and the All-Freshman team in 2011). The selections of Powers and Ferguson to the all-conference team in 2013 marked the first time since 2007 that multiple Georgia Southern players had earned all-conference accolades in the same season. In 2013, he led the Eagles to a victory over Virginia Tech for the first win in program history over a team from the ACC. Young has been recognized throughout his career as one of the nation’s best evaluators of talent. He was named one of the nation’s top recruiters by InsiderHoops.com in 2002 and recognized again for his ability to evaluate and recruit talent as one of the nation’s top-25 assistant coaches by Rivals.com in 2007. Young’s recruiting roots run deep and his list of recruiting success has run long throughout his career on the Division I level. The Seminoles’ recruiting class in 2015 (his first full class at Florida State) was ranked third nationally by 247sports.com and included Malik Beasley, a first round pick of the Denver Nuggets in the 2016 NBA Draft. His 2016 class at Florida State included one of the top ranked high school players in school history in Jonathan Isaac, the No. 6 overall selection in the 2017 NBA Draft by the Orlando Magic. The Seminoles’ 2016 recruiting class was ranked No. 8 nationally. His first recruiting class at Auburn (2001) was ranked as the nation’s third best by ESPN.com. His 2010 recruiting class (his first full class at Georgia Southern) was ranked as the sixth best nationally and the best in the Southern Conference and among mid-majors by ESPN.com. His first class at Georgia Tech (2006) was ranked as the nation’s seventh best by Dave Telep of Scout.com and his only recruiting class at Northeastern (2000) is still considered to be the best in school history. While an assistant at Georgia Tech, Young recruited and signed Derrick Favors – the nation’s No. 1 recruit. Favors was the No. 3 overall selection by the New Jersey Nets in the 2010 NBA Draft and currently plays for the Utah Jazz. In his only season at Georgia Tech, Favors was named to the ACC All-Freshman Team as he averaged 12.4 points, 8.4 rebounds and shot .611 from the field. Young also recruited Iman Shumpert (a current member of the Sacramento Kings who played for the Cleveland Cavaliers in the 2015 and 2016 NBA Finals) to the Atlanta-based ACC school. Shumpert was a member of the Cavaliers 2016 NBA World Championship team. Young also helped recruit Thaddeus Young (the 12th overall pick of the 2007 NBA Draft by the Philadelphia 76ers) and Javaris Crittenton (the 19th overall selection in the 2007 NBA Draft by the Los Angeles Lakers) to Georgia Tech while he was an assistant with the Yellow Jackets. Young is currently a member of the Indiana Pacers. He recruited 5-star guard and McDonald’s All-American Dwayne Bacon to Florida State in 2015. Bacon was the only 5-star player to sign at an ACC school other than Duke for the 2015-16 season. Bacon earned ACC All-Freshman team honors and was named the ACC Rookie of the Week a school-record five times in his first season as a Seminole. Young was with Bacon at the Barclays Center when he was selected in the second round of the 2017 NBA Draft. He recruited Malik Beasley to play at Florida State. Beasley, the first one-and-done player in school history, was selected in the first round of the 2016 NBA Draft and is in his third season as member of the Denver Nuggets. Young was an assistant coach at Jacksonville (1997-99) under Head Coach Hugh Durham, a Hall of Fame coach in Florida State basketball history. With Young on the staff, the Dolphins improved their overall and conference win totals in both years he worked with the legendary Florida State Hall of Fame member who took the Seminoles to the championship game of the 1972 NCAA Tournament against basketball legend John Wooden and UCLA. Young is a native of Miami, Fla., where he began to make a name for himself at Carol City High School. He led the Chiefs to a state championship as a junior and earned a nomination for the prestigious McDonald’s All-American team as a senior. Young was part of the Carol City teams that earned a 66-7 record (.904 winning percentage) during his junior and senior seasons. In four years as an assistant coach under Paul Hewitt at Georgia Tech (2006-09) he helped coach the Yellow Jackets into the NCAA Tournament in 2007 and to seven victories over ranked teams. Included in the Jackets’ victories over ranked teams were wins over No. 4 ranked Wake Forest on January 31, 2009, No. 8 North Carolina on March 1, 2007 and No. 11 Duke on January 10, 2007. 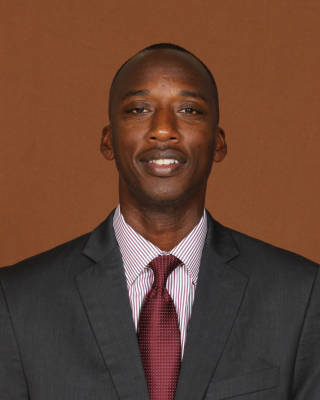 During his career at Georgia Tech, he helped develop the careers of eight players who have or who are playing in the NBA including first round draft choices Thaddeus Young, Derrick Favors, Iman Shumpert and second round picks Gani Lawal and Glen Rice, Jr.
Young was named the Associate Head Coach at the University of Tennessee Chattanooga where he earned success as a coach on the collegiate level. The Mocs won the North Division championship of the Southern Conference, won the Southern Conference Championship and played in the schools’ first NCAA Tournament since 1997 in his only season at Chattanooga in 2005. Young helped build Auburn into one of the top programs in the SEC during two different and very successful stretches with the Tigers (1994-97 and 2000-04). During his time at Auburn, he helped recruit Chris Porter and Marquis Daniels to the Plains. Porter was a second round pick of the Golden State Warriors in 2000 while Daniels was signed as a free agent by the Dallas Mavericks in 2003. Porter led Auburn to the Sweet 16 of the NCAA Tournament in 2000 while Daniels led the Tigers to the Sweet 16 of the NCAA Tournament in 2003. Young was an assistant coach at Northeastern for one season (2000) where he worked with Marcus Blossom, one of the top 10 scorers in school history. Blossom earned all-conference honors in the America East during Young’s only season with the Huskies. He is currently the Senior Associate Director of Athletics for Business and Administration at Boston College. One of the greatest players in Georgia Southern history, Young is one of only nine payers in school history to score more than 1,500 career points (ninth, 1,517 career points) and still has his name etched prominently in the Georgia Southern record book. One of the greatest shooters in school history, Young is still the school’s career leader in 3-point field goal shooting percentage (.409), is ranked third in school history in career free throw shooting percentage (.781) and shot nearly .460 from the field during his four-year varsity letter winning career. More than 20 years after his playing career ended in 1993, Young is still ranked in the top-10 in school history for career assists (second, 530), career 3-point field goals made (fourth, 241), career 3-point field goals attempted (fifth, 589), career steals (sixth, 162), career field goals attempted (ninth, 1,166) and career field goals made (tied for 10th, 533). He led the Eagles with a career high 17.1 points per game scoring average as a senior in 1993, led the team in 3-point field goals made three times (1991, 1992 and 1993) and led the team in assists each of his four seasons as the Eagles’ starting point guard. Young was Georgia Southern’s leader in points scored (479), points per game (17.1 ppg), 3-point field goals made (93), 3-point field goals attempted (225), 3-point field goal percentage (.413), free throw percentage (.754), steals (52) and assists (143) during his senior season (1992-93). Young was a three-time all-conference selection at the point guard position in two different leagues during his four years on the varsity at Georgia Southern (1990-93). He earned all-conference second team honors in the Trans America Athletic Conference in 1991 and 1992 and all-conference first team honors in the Southern Conference during his senior season in 1993. Young was named the Most Valuable Player of the TAAC Tournament in 1992 as he led the Eagles to one of three conference championships in school history. He is one of only two players in school history to earn conference tournament MVP honors. The Eagles’ victory over Georgia State in the 1992 TAAC Tournament propelled Georgia Southern into the NCAA Division I Men’s Basketball Tournament for only the third time in school history. Young was recognized as a Basketball Legend by the Southern Conference during the Southern Conference Tournament in 1995. Young is one of 10 players in school history who has been inducted into the Men’s Basketball Hall of Fame at Georgia Southern. He was inducted into the school’s Athletic Hall of Fame in 2008. Young played professionally in France in 1994 before returning to Georgia Southern to earn his degree in broadcasting. Young, 47, and his wife, Carolyn, have four children: daughters Ariel and Audia and sons Isaiah and Nehemiah. Carolyn is a two-time Kodak All-American selection who led Auburn to a pair of Final Four appearances during her career. At Auburn she was named the SEC Player of the Year in 1991 and played for the Portland Fire of the WNBA. She was a member of the 1992 United States Olympic National Team that won the Bronze Medal at the 1992 Barcelona Olympics. Ariel is currently a freshman member of the women’s basketball team at the University of Michigan.